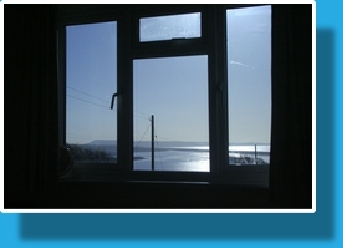 The Bungalow at Sea Barn Farm is self-catering accommodation like none you have ever seen - its views are spectacular. This comparatively modern wifi-enabled, three-bedroom holiday let scores over many other holiday cottages in the area because of its open aspect and panoramic sea views. Bedroom 3: 1 single-bed and 1 bunk-bed. In addition, there is a kitchen, a lounge, a shower-room and an additional separate wc. 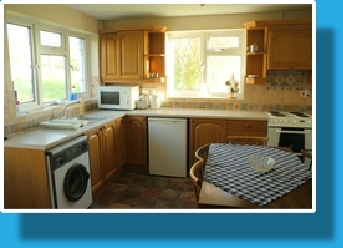 Necessities (cutlery and crockery) are provided, along with a fitted-kitchen, microwave, colour TV and DVD. Duvets and pillows are provided but guests usually bring their own linen and towels. If you prefer us to supply linen this can be arranged by prior agreement for an additional charge. Guest at the Bungalow are welcome to use the play areas, swimming pool (summer only) and clubhouse at West Fleet Holiday Farm at no extra charge. 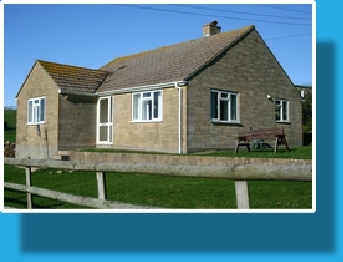 The Bungalow looks out over Sea Barn Farm and the farmland running down to the Fleet. The Master bedroom and lounge have a southerly outlook to the Fleet, Chesil Beach and the sea, whilst the kitchen and other bedrooms look out over fields and stables. Families and those who love great scenery will enjoy the ever-changing seascapes and views over the Fleet Lagoon throughout the year.